"Encounters" is a short narrative piece created in Maya. I was responsible for all of the modeling, texturing, rigging, lighting, and animation. This piece features inanimate objects as characters. The bag of marshmallows has an escapee and must get him back. Download This was an exercise demonstrating a person lifting and carrying a heavy box up stairs. This was a variation of a bouncing ball animation with a spherical bunny character. This animation can be looped. Don jumps from a little island back onto the mainland. Download Hindered walk cycle. Don drags Jev behind him. This animation is intended to be looped. 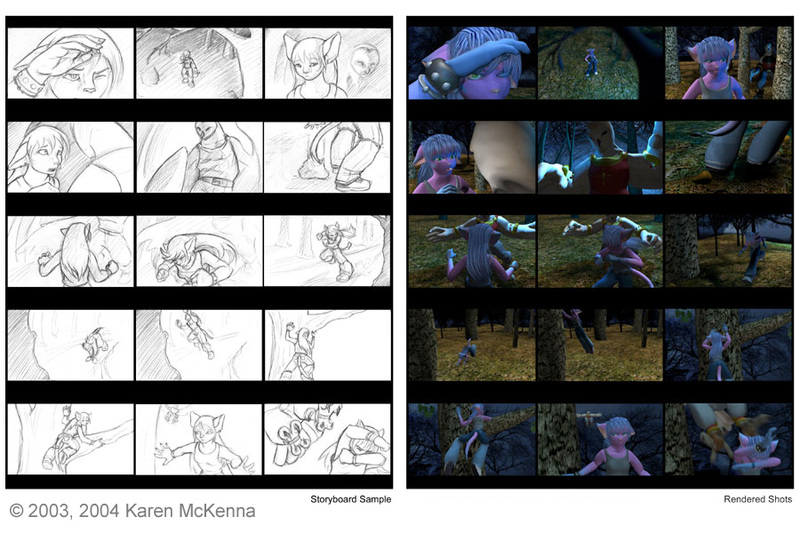 This is a portion of the storyboard from my animated piece "Encounters," with the final rendered shots next to it for comparison. This is my first attempt to use Flash to tell a story. Bunny takes on the evil Farmer Frutti. A simple interactive scene. Click on or drag characters and objects to move and interact with them. Photoshop 2D sprites created for a Zelda-inspired game "The Lost Legend."